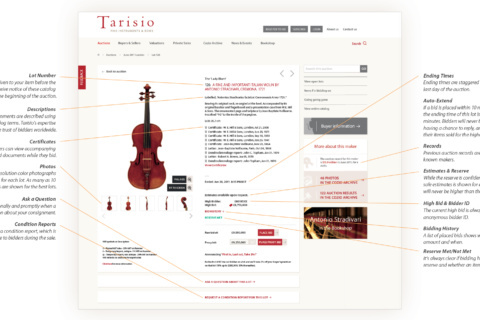 Bidders must register for each Tarisio auction in which they wish to participate. To register online, follow the Register to Bid link. On our secure server, registrants will submit their contact information and will be asked to choose a Bidder ID. The Bidder ID will be visible to others browsing the site and should not identify the bidder. All registration information is kept strictly confidential and secure. Bidders are responsible for keeping their registration information and preferences up to date and correct. To make changes to an existing registration, click the My Account link. There is a $1.00 charge to register. Tarisio reserves the right to refuse the registration of any bidder at any time. Each lot has a separate ending time and date as listed in the catalog. Ending times are staggered to accommodate bidders interested in multiple lots. All times are listed in Eastern Standard (EST), Eastern Daylight Time (EDT), Greenwich Mean Time (GMT) or British Summer Time (BST) as appropriate. Bidders are encouraged to place bids online, but those without access to the internet may leave bids at the viewings, or submit bids by telephone or fax. To place bids by telephone or fax please call +1 800 814 4188 (New York sales) or +44 (0)20 7354 5763 (London sales) after having registered with Tarisio in advance. Please note: Faxed, left, and telephone bids are handled as proxy bids (see below). These services are provided as a courtesy to bidders, and although every effort will be made to execute bids on time and accurately, Tarisio will not be responsible for any error or failures to execute left bids. In the event that identical bids are left by two or more parties, Tarisio will honor the first bid received. A proxy bid is similar to a left bid in a traditional auction and allows bidders extra flexibility in the bidding process. By placing a proxy bid, a bidder sets a maximum amount that he or she is willing to spend and enables the auction software to execute bids as necessary on his or her behalf. The auction software will place an initial bid (one increment above the current bid) and then wait. If a challenging bid is placed by another bidder, the auction software will automatically execute a bid on behalf of the original proxy bid (again, one increment above the current bid). The auction software attempts to place as few bids as possible in order to keep the bid amount as low as possible. Under no circumstances will the auction software exceed the amount of a proxy bid. A proxy bid is strictly confidential and is encrypted securely in the auction software. To place a proxy bid, the bidder should select the relevant lot and click the Place Proxy Bid button. After selecting a proxy bid amount from the drop-down list, the bidder is asked to confirm his or her Bidder ID and password. The bidder will then receive an email confirming that a proxy bid has been placed. If the maximum amount of the proxy bid is ever exceeded, the bidder will receive an outbid notice by email. 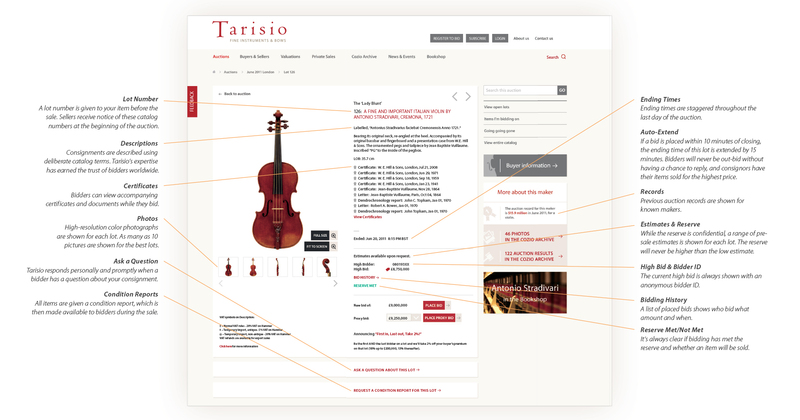 Tarisio’s website provides complete and current bidding history for all lots. The bidding history details the time and date, Bidder ID, and amount of each bid. If there is active bidding within the last 10 minutes of a particular lot’s published ending time, the ending time will automatically extend for 15 minutes. This is done as a courtesy to the recently out-bid bidder. The ending time can continue to extend indefinitely for as long as there is active bidding. Because of the way web pages work, the bidding information you see on your computer screen may at times be slightly out of date. Tarisio’s lot pages will automatically refresh every two minutes; however, to make sure you are seeing the most accurate up-to-date bidding information, you can click Refresh or Reload on your browser window to request the latest bidding information from our server. When the reserve for a lot is met or exceeded, a highlighted message appears beneath the description of the lot reading Reserve Met. If the reserve has not yet been met, the message will instead read Reserve Not Met. The high bidder at the closing time of each lot will be emailed a successful bid confirmation detailing the lot number, description, and final bid amount; each high bidder is also requested to set their shipping, payment and other preferences. Within 48 hours of the close of the sale, bidders will receive a preliminary invoice for the lot(s) they have successfully purchased. The invoice will include the buyer’s premium and any applicable shipping fees and taxes based on the bidder’s preferences. It is the responsibility of the bidder to notify Tarisio should he or she wish to have a particular purchase shipped or invoiced by means other than those specified on the preliminary invoice.